Australia is one of the world’s most developed countries, constantly attracting people who seek high-quality life, education health and even economic freedom. Ranked as the 12th largest economy in the world, Australia is one of the world’s wealthiest countries and therefore home to quite a number of billionaires. According to a recent evaluation by Forbes, these are the top 25 richest people in Australia. Note, however, that this list is subject to alterations with respect to time as the net worth of these people are directly or indirectly dependent on the fluctuations of market prices and the economy at large. This pair met while studying at the University of New South Wales and in 2002 they both co-founded Atlassian, an Australian business software company which develops products that aid software developers and project managers. One of its most popular application is JIRA an issue tracking application and Confluence, a team collaboration product. The company employs over 1400 people and has a customer base of more than 50,000 people including 85 of the Fortune 100. The company went public in December 2015 and that saw their market capitalization rise to over $4 billion. Len Ainsworth founded Aristocrat Leisure in 1953 and today it is the largest gaming manufacturer in Australia and among the world’s biggest slot machine manufacturers. In 1994, after receiving what turned out to be a misdiagnosis of cancer, he stepped down from the company but held on to his stakes. He handed the control of the company to his 7 sons. However, in 1995, he founded a similar company Ainsworth Game Technology and currently serves as its CEO. Kerry Matthew Stokes is one of the self-made billionaires on this list, starting out as a TV antenna installer, he is now a media tycoon thanks to his Seven Group broadcasting corporation. He also made his fortune from mining through his investment in Caterpillar Industrial equipment. Kerry is a diversified investor, he is involved with other businesses such as property, print media and most recently agriculture. He’s an avid collector of paintings. Alan Rydge father Norman handed Greater Union cinema chain to him as his inheritance 35 years ago. He has since translated it into Australia’s largest cinema group, as part of Amalgamated Holdings, a corporation that owns and operates brands in the entertainment, hospitality and leisure sectors, mainly within Australasia. The company of which Rydge owns 44% also owns Thredbo ski resort and the Rydges and QT hotel chains. He has a big stake in listed company Carlton Investments, which buys blue chip stocks. Lang walker is the co-founder of walker group which was officially renamed walker Corporation by Pty Limited. The company is a privately owned Australian development company, with developments in Australia, USA, Canada and Malaysia. It is responsible for the development and restoration of a number of significant Australian sites, including King Street Wharf, Finger Wharf, Broadway Shopping Center and Rhodes Shopping Center in Sydney. The property company is fully owned and operated by its co-founder and CEO, Lang Walker. Robert Ell is an Australian property developer and the founder of Leda Group, a privately owned property development Company. The business tycoon founded the company in 1976 and has interests in residential, retail, commercial and industrial property. He controls more than 16,000 housing lots in Queensland and New South Wales. The company also owns four shopping malls in Queensland, and unloaded a key office investment in Sydney’s Milson Point in 2014 to Chinese investors for $80 million. He started out with commercial property development and construction in Sydney. The real estate investor bought his first property in the 1950s and established Pacific Shopping Centers in 1979 when he left Poland for Australia at the end of World War One. Currently, he owns malls in Melbourne, northern Victoria and Adelaide. His son Sam runs the group, and also a fund-management-and-property-development business known as Austpac. Gerry Harvey is an Australian entrepreneur famous for being the executive chairman of Harvey Norman Holdings, a company which runs Australian retail chain Harvey Norman. He co-founded Norman Ross (electronics retailer) in 1961 with Ian Norman. When that business was taken over, both men dumped it, opening electrical-goods and furniture chain Harvey Norman in 1982. He earns most of his fortune from his shares in the publicly traded establishment. David Teoh is the founder and chief executive officer of TPG group of companies, one of the largest privately owned internet businesses in Australia. He owns 37% stake in the Australian telecommunications and IT company that specializes in consumer and business internet services as well as mobile telephone services. He started out as a computer retailer and moved from Malaysia to Sydney in 1986. Stanley is an Australian entrepreneur and philanthropist. He is, without doubt, one of Australia’s largest landlords with a portfolio that covers the country. His holdings are mostly shopping malls and commercial high-rise buildings. He additionally has a Toyota distributorship, bestowed to him personally by the Toyoda family 50 years ago. Michael is a British-Australian entrepreneur, philanthropist and Conservative Party patron, based in the United Kingdom. He was born in the Chinese city of Harbin. He unloaded his own hedge fund company, CQS and has been cited in the press as one of the highest earning people in the City of London. Leslie Wilson best known as Alan, heads Reece Australia, Australia’s largest bathroom – and plumbing-supply retailer. He shares the wealth with 2 brothers, John and Bruce; while his son Peter is the CEO of the company. The family owns nearly 70% of the 450-outlet chain it has managed for more than 50 years. He was asked about Reece’s sparse public disclosures at the 2014 yearly meeting, he said he knows a lot about competitors from investor briefings. Australian billionaire Heloise Waislitz, one of the daughters of packaging tycoon Richard Pratt, inherited a sizeable fortune (Visy packaging business) from her father along with billionaire brother and sister Anthony Pratt and Fiona Geminder. Additionally, she has created security and property portfolio known as Thorney Holdings, with her special someone (husband) Alex. Just last year, they offered a small equities fund, Thorney Opportunities, on the Australian Stock Exchange, retaining a 30% stake. Fiona Geminder is the youngest daughter of the packaging tycoon Richard Pratt. The publicity-shy lady is one of Australia’s richest people. She owns up to 40% of plastic packaging business Pact Group with husband Raphael Geminder. She also has a stake in Visy, the family’s Melbourne-headquartered paper packaging and recycling business, along with brother Anthony Pratt and sister Heloise Waislitz. David Hains is a horse breeder in Kingston Park Stud in Merricks North, Victoria. He also works from Melbourne headquarters of his family’s private hedge fund, Portland House Group, which he runs with his sons. The Portland House Group portfolio include equities, bonds, fixed interest, property and managed funds globally. His Portland House Group is now Australia’s biggest hedge fund and also has offices in New York and London. Andrew Forrest is an iron ore magnate currently a non-executive chairman and formerly the chief executive officer of Fortescue Metals Group (FMG). He worked as a stockbroker at the brokerage houses Kirke Securities and Jacksons immediately he completed his studies. In 1994, he established Anaconda Nickel (now Minara Resources). In 2003, he established Fortescue Metals Group, which mines and ships iron ore to China. The company has since grown to take three times the spaces of its closest rival in Western Australia’s iron ore-rich Pilbara region. Lindsay Fox is an Australian businessman and the founder of Linfox, the Australian logistics company which was founded in 1956. The company is the country’s biggest privately held logistics company with more than 5,000 trucks across ten countries throughout the Asia-Pacific region. He dropped out of school due to his lack of academic interest at age 16 to become a truck driver like his father, buying his first truck at age 19. Although the trucking tycoon is no longer involved in the everyday running of the business as he now leaves management to his two sons Peter and Andrew, the business is still blooming well. Kerr Neilson, the co-founder and the managing director of Platinum Asset Management is another Australian billionaire who is listed on Forbes list of the richest people in Australia. After the entrepreneur moved to Sydney from South Africa a decade earlier to work for Bankers Trust Australia, he co-founded international equities fund manager Platinum Asset Management in 1994. He retains 55.5% of his company after partially cashing out in a well-timed 2007 IPO. He is often compared to Warren Buffett due to his ability to consistently select high-performing stocks. Anthony is the Chairman and CEO of Pratt Industries and Global Chairman of Visy Industries, the world’s largest privately owned packaging and paper company. The Pratts’ wealth, has more than tripled since he took over the Visy packaging and recycling businesses in Australasia and the U.S. in 2009. The business was started in 1948 by his grandfather Leon and was further expanded by his late father Richard. Anthony runs the branch of the company in the U.S., where Pratt Industries is the largest manufacturer of corrugated cardboard. John Gandel is a real estate investor and philanthropist. He earned the bulk of his fortune in the development of commercial real estate as well as shopping centers situated in Melbourne, Victoria. He inherited his parents’ women’s clothing business (then called Sussan) in the 1950s. He then developed it with his brother-in-law Marc Besen into a chain of more than 200 stores. He later purchased Chadstone Shopping Centre in 1983 and sold Sussan to his brother-in-law in 1985 to focus fully on real estate. He subsequently made his own money from shopping centers. Ivan Glasenberg is the chief executive officer of Glencore, one of the biggest commodity trading and mining companies around the globe. He also sits on the boards of mining companies Xstrata plc and Minara Resources Ltd. He earned money when the company went public in 2011. The entrepreneur obtained his MBA from the University of Southern California in 1983 and then joined the late legendary oil trader Marc Rich, working as a marketer in the coal and coke department in his native South Africa. James Packer is the son of late media mogul Kerry Packer and grandson of Sir Frank Packer. He obtained his Higher School Certificate at Cranbrook School in Bellevue hill Sydney. He is now chairperson of Crown Limited, one of the country’s biggest entertainment and integrated resort groups. Crown’s Australian resorts attract more than 25 million visits every year. His gaming empire, Crown Ltd owns casinos in Australia and has a joint venture–Melco Crown Entertainment–in Macau and Manila with billionaire Lawrence Ho. 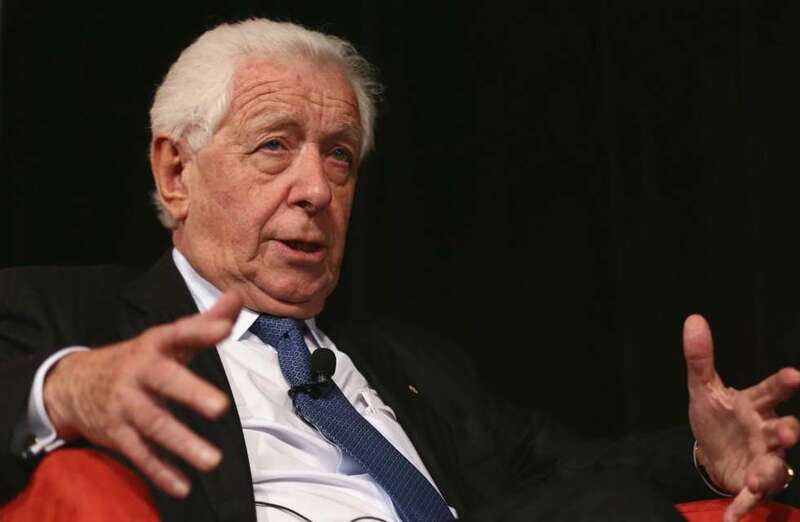 Frank Lowy, an Australian business tycoon is a co-founder of the Westfield Group, operator of more than 100 shopping centers spread across different countries including Australia, New Zealand, the United States and the United Kingdom. He chairs both; sons Peter and Steven operate Westfield Corp, which owns 44 malls in the U.S, U.K. and Europe. Scentre, which listed in June 2014, has 47 malls in Australia and New Zealand. In October 2014, the family increased its stake in Westfield Corp.
Harry Oscar Triguboff is an Australian billionaire and a residential property developer. He is the founder and managing director of Meriton, Australia’s largest apartment builder mostly in Sydney. He started his working life in the textile business, shifting to real estate in the early 1960s. He has built up more than 55,000 apartments, earning him the nickname “High Rise Harry. Gina Rinehart is a mining heiress and Chairman of Hancock Prospecting group, which has included oil and gas to its portfolio. She became the Chairman of the privately owned Hancock Prospecting Pty Limited (HPPL) and the HPPL Group of companies after the death of her father in March 1992. She is the daughter of Lang Hancock and Hope Margaret Nicholas and the heiress to her late father’s fortune. In March 2014, she concluded her largest deal yet: $7.2 billion in funding from a group of global banks and credit agencies to develop Roy Hill, one of the largest iron-ore mines in the world; Rinehart’s Hancock owns 70%. And thus is the queen of the global iron-ore trade.